The average IT admin’s day is busy. There are a lot of areas where IT organizations can spend their time. With cloud transformation, mobile, security, DevOps, and thousands of other areas, IT admins’ hands are more than full. Despite this workload, identity management should be at the forefront of every IT admin’s checklist. But, why identity management? Let’s find out. 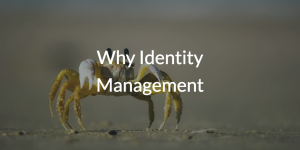 What Does Identity Management Look Like? Of course, savvy IT admins know that identity management is the center of an IT network; it’s a catalyst for being able to securely leverage a wide range of IT solutions. In short, being able to efficiently deal with the cloud, mobile, DevOps, and more starts with a solid identity management foundation. Modern IT networks are heterogeneous environments with a variety of locations. Some resources are located on-prem, some are in the cloud, and some are in remote offices or locations with contractors and/or employees. Having a unified method of controlling access to systems and resources is key to strong identity management. We also know that identity security is one of the top issues that IT organizations face. Identities are the fastest conduit to critical and confidential data. Furthermore, by seamlessly connecting end users to the IT resources they need including systems, applications, files, and networks regardless of platform, protocol, provider, and location, IT admins are increasing productivity.